STiPS has sought methods to facilitate communication between specialists and citizens. On this page, we introduce examples of their activities. First, they held the Consensus Conference to Consider Genetically Modified Crops, which created a space for citizens to engage in debate, thus encouraging their participation in science and technology issues. Second, at the Open Dialogue Forum on Nuclear Issues, citizens participated from the information input stage. 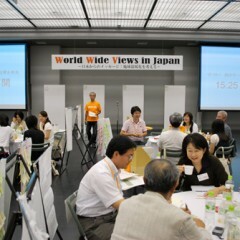 At the World Wide Views on Global Warming, discussions were conducted by over 100 citizens coming from all over Japan. At the Deliberative Caravan, specialists and citizens cooperated to develop questions that should be discussed in society. ■ “Citizens,” not experts, produce consensus. ■ Dissemination of this consensus to society. ■ Dialogues “between nuclear power specialists” with differing opinions. ■ Participatory role based on the space (dialogue rules). ■ Investigating the nature of spaces for fair dialogue. World Wide Views on Global Warming was a worldwide citizen conference on issues relating to global warming. This conference was held in various countries and localities on the same day, addressing the same questions, based on the same information, and using the same method. World Wide Views emerged to transmit the voices of citizens around the world to the 15thConference of the Parties to the United Nations Framework Convention on Climate Change (COP15), held in 2009 in Copenhagen. 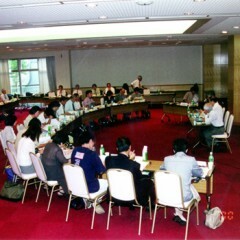 In Japan, it was held in Kyoto, the site of the adoption of the Kyoto Protocol, under the auspices of the Executive Committee of World Wide Views in Japan. Policies regarding not only the problem of global warming but also general environmental problems exert a considerable influence on our lives. Therefore, we require spaces in which citizens can become involved before determining these policies. ■ Roughly 3800 citizens from 44 countries participated. 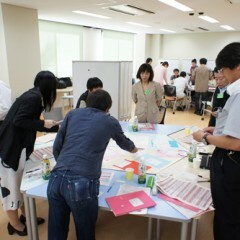 ■ Discussions used the same method based on the same materials on the same day. 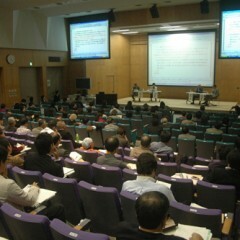 ■ A public consultation was held in preparation for COP15. The Deliberative Caravan sought new issues and directions for responses to new science and technology such as regenerative medicine. It was designed as a space in which a diverse set of people—specialists, policy makers, citizen action groups, and individual citizens—could engage in discussions. The focus of the Deliberative Caravan was not policy proposals but (1) proposing an agenda of questions to be discussed in society for the practical use of new science and technology and (2) planting new seeds for debates in society. The agendas formulated in the Opinion Eliciting Workshop and the Agenda Formulation Meeting were used in surveys of society, proposed to academic societies and governments, and employed for other purposes. ■ 180 discussion point cards. ■ Agenda formulation based on cooperation between citizens and specialists. ■ Participatory technology assessment based on networks.